Have you ever had an idea in your head that seemed so good, but then in reality wasn't so good?? Yeah, happens to me more times than I care to admit. 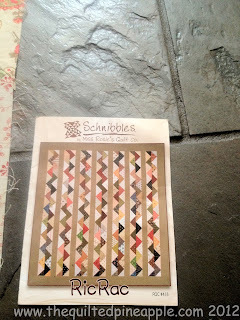 So last year I was going to make RicRac, a Schnibbles pattern from Miss Rosie's Quilt Co by Carrie Nelson. I was making it for one of the month's Le Petite Parades. Anyways, I had won a Layer Cake of Grace by 3 Sisters for Moda and thought I would use the layer cake instead of charm squares for the pattern. Instead of cutting the layer cake into sizes equivalent to charm squares, I decided to just cut the layer cake up as if it was a large charm square pack. I would follow the pattern, just substitute really big pieces for the small ones. Doesn't sound so bad? Yeah, that's where my brain and reality were on two different pages. And for the record, Carrie kindly gives directions if you want to use a layer cake, but I thought I was sooooo clever and ignored them...HA!!!!! For reference, here is the pattern. It finishes at 38" x 40". Well, actually I did adjust the pattern, I added more pieces to make my quilt even longer and wider. So what did I end up with?? Ummmmm, these are about 111" long!!! Yes, they are. This has wonky, snake like rows written all over it!! Why you ask was I thinking this was a good idea? Simple. I do not have a quilt for my bed. I am the Queen of Small Quilts and giving quilts away, yet never take the time to make a quilt for my own bed. We sleep under the most pathetic comforter EVER. I will only reveal it, once I have a quilt on my bed, which I hope you all continue to read my blog for a very long time! :-) So basically, I was thinking this would be a great king size quilt for my bed. I was so nervous to join the two rows together. I was afraid one would end up being longer or it would look like a giant "S". Like a big "S" for Michigan State. Normally, I would love that, but not so much in this case. :-) Carrie gave a helpful hint to mark the center of each triangle and match them up, as too avoid "growing" rows. I took the time to do that and carefully sew them together. Fun design and pretty fabric to go with it. So this will be an Olympic sized quilt then right? One of my earliest quilts I made was a tree quilt. The blocks were laid out on the floor and my husband asked, will it fit our bed? No. 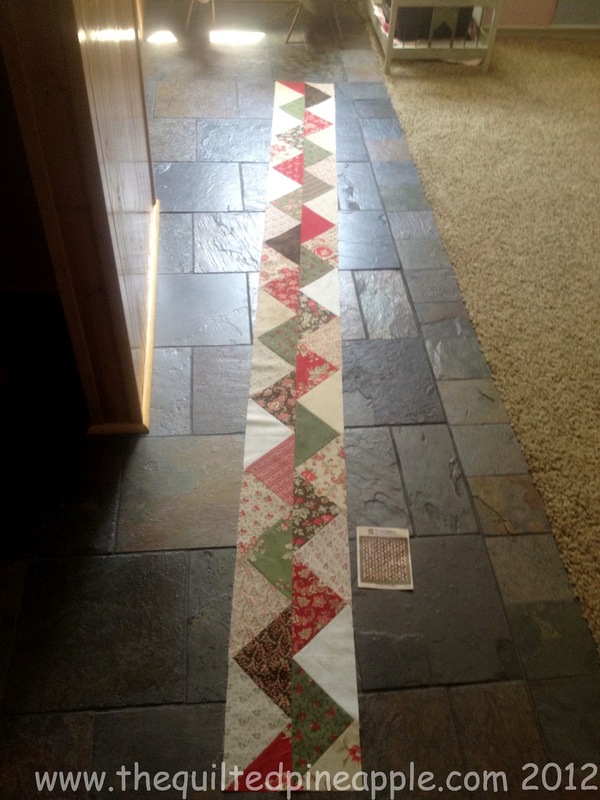 So I made more blocks and the quilt finished at 107" square. Pretty and now my son has claimed it for "one day." Wow. I think it looks great !! And a good choice of fabrics. It will be wonderful when it's done and now I can't wait to see it on your bed and I'm really dying to see your pathetic comforter! It's going to be gorgeous, Linda, get busy, lol! I have a fq bundle of Grace that is waiting patiently for some attention. Your quilt will look great! I decided a few years ago that I was tired of being a quilter with no quilts so I have a few that are actually mine. That turned out really really good. I hear you on the pathetic comforter part. We have one of those on our bed as well because I usually give the majority of my quilts away in the form of baby quilts, so that is on my list to make some day. Key phrase some day. Keep up the good work! I now have a quilt on my bed AFTER making quilts for both children, all five grandchildren, my two sisters, and assorted nephews and a niece. You, too, will have a quilt for your very own bed one day soon! 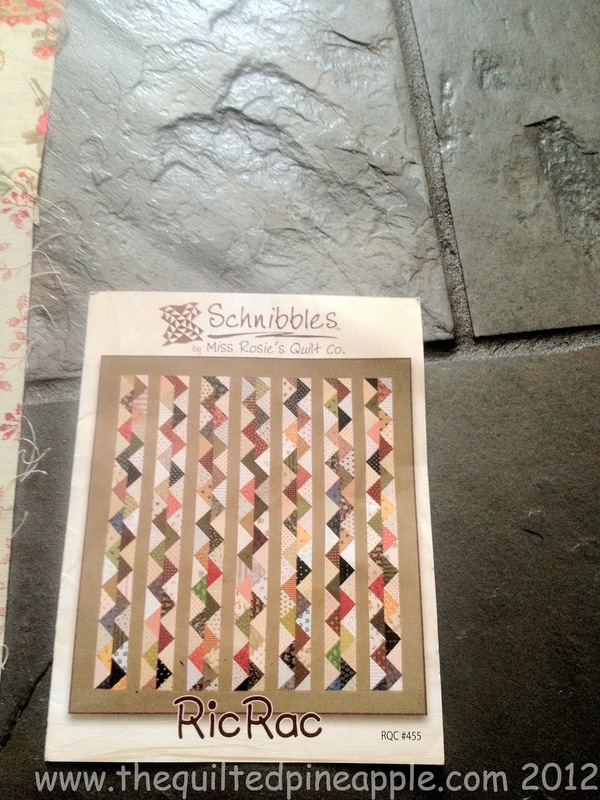 Love this pattern and am looking forward to watching your quilt progress! I really like it!! I hope you can finish before the next Olympics and I think it is great to think outside the box!! Otherwise we wouldn't have all of these cool things to try! Looks good! I have a king size bed as well...using old trendy quilt that needs to be updated! I just need to find some time to work on one! What is it about us quilters, I bought a LA about 2 yrs ago so I could finish up my projects, instead all of my mothers, my sister, and all of their friends quilts are finished and mine are still hanging in the closet. You should finish it though, the first row is beautiful and I can only imagine how wonderfull it will be done when you are done. Thank you so much, Rose!!!! Yep, seems everyone gets a quilt but us! :-) I am replying here, so I hope you read this. You are a No-reply blogger so I don't have your email. You are going to have a GIANT lovely quilt. Can't wait to see it. It is going to be beautiful!! You are so funny. You crack me up. I can totally hear you talking in this post! I think it's going to be fabulous! Good job! And I don't have a quilt for my own bed yet either. haha! who doesn't love rick rack, giant rick rack even better when it makes a quilt. 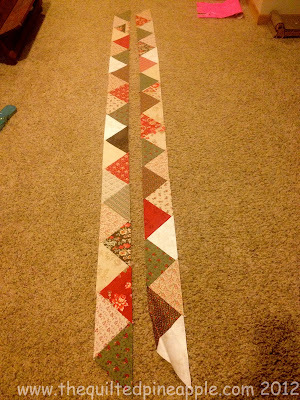 That is going to be great quilt and I can't wait to see how you quilt it. Are thinking about that too? That is AWESOME! I have a "store bought" quilt on my bed and I am ALWAYS at the sewing machine-lol. I'm doing a UFO project and am almost finished with the last quilt in the series. It has been great to actually get some of my ufo's done. I'm thinking I will do it again with 4 more projects. So anyway, I love your color choices. Your blog is awesome too. I'm a new member. Thanks for sharing! Too funny, Linda! 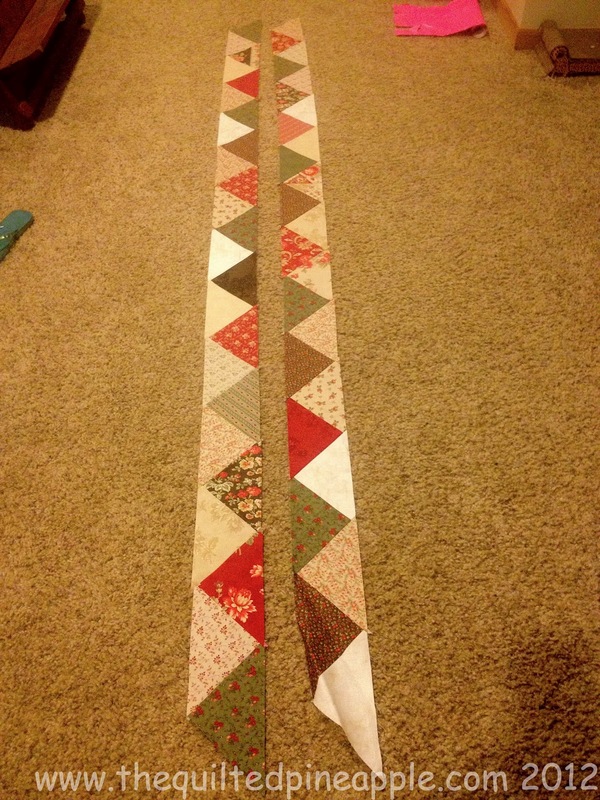 I hope you can get rid of your raggedy old comforter soon - looks like it's going to be a gorgeous quilt!